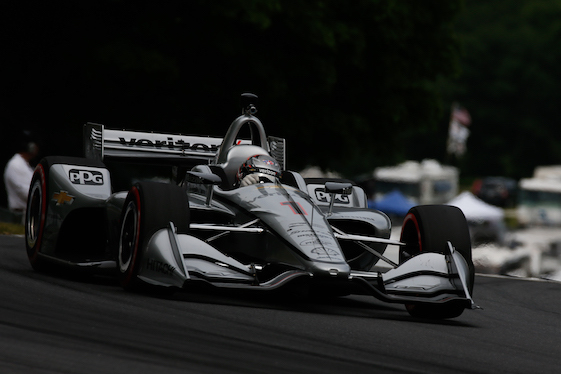 Josef Newgarden led all but two laps of Sunday IndyCar Series race at the Road America road circuit but his ride was anything but relaxing as Ryan Hunter-Reay dogged the defending series champion for almost the entire second half of the race. Newgarden’s margin of victory in his Team Penske Chevy over Hunter-Reay’s Andretti Autosport Honda was 3.3 seconds, but for lap after dozens of laps, it was just tenths of a second. “I wanted to win here since last year when I felt like we had a car to win,” Newgarden said. “But this car has been a rocket all weekend. It was not easy, Ryan was very quick and I knew (Scott) Dixon was right behind him so we were working for it the entire race. The victory was the first for pole-sitter Newgarden at the 4-mile, 14-turn track that snakes through the hills and woods of central Wisconsin. It was his third of the season but it gave him his first podium finish in the last six races. Dixon, in the No. 9 Chip Ganassi Honda finished third 5.4 seconds behind Newgarden after his charge toward the front faded late. Dixon said his shot at victory may have ended on Saturday when he qualified eighth fastest. “Little disappointed with where we started,” he said. “I think if we would have had a better run in qualifying, the car definitely had the speed. Takuma Sato and Robert Wickens rounded out the top five in Honda-powered cars. Dixon 393, Hunter-Reay 348, Rossi 348, Newgarden 343, Power 328, Rahal 278, Wickens 274, Pagenaud 255, Bourdais 235, Andretti 232.